Oh, yes. This is happening. 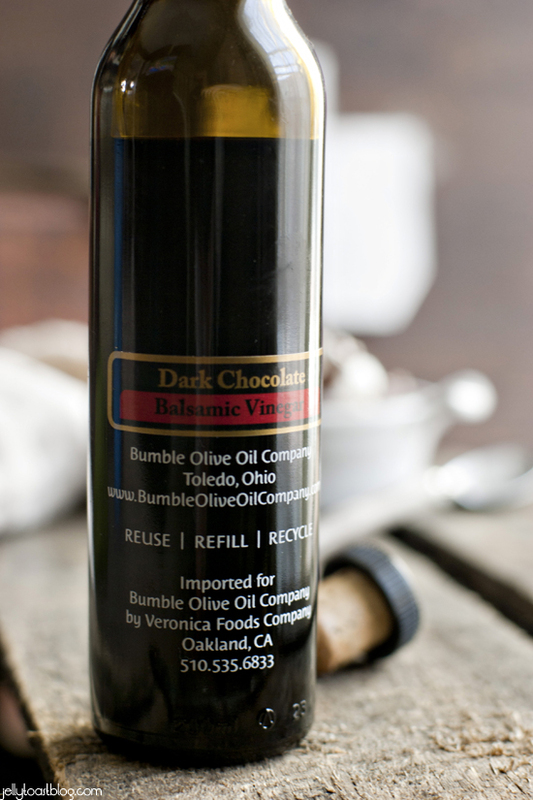 Remember the other day when I mentioned Bumble Olive Oil Company’s Dark Chocolate Balsamic Vinegar? I’ve been thinking about it a lot, too. In fact, I seem to have developed this bad habit of keeping it on my counter and drinking little shots of it every time I pass by. Well, after having my thoughts consumed by chocolate vinegar for several weeks, I decided I needed to bake something proper with it. I love bread pudding. Love it. 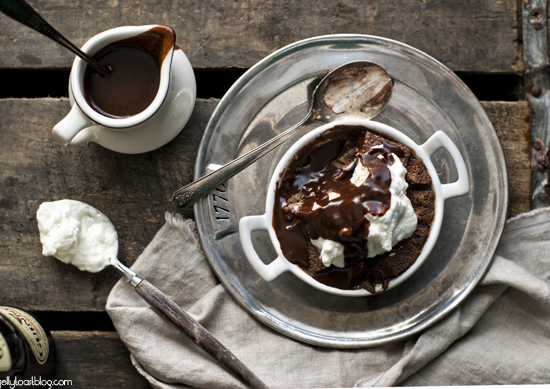 This Chocolate Balsamic Bread Pudding is so decadent and rich, all without being overly sweet. The chocolatey-ness (is that a word?) is deepened by the presence of the Dark Chocolate Balsamic Vinegar; not to mention the Organic Butter Infused Olive Oil. Yes, Bumble has an olive oil that tastes like butter. Perfect on popcorn or anything you feel like pouring melted butter on, Bumble’s Organic Butter Infused Olive Oil gives you all of the health benefits of olive oil and all of the yummy taste of butter. My kids can inhale a huge bowl of popcorn covered in the stuff. And by ‘my kids’ I mean me. Don’t worry, I’m good at sharing. And speaking of sharing, let me return to this bread pudding that I’m so eager to share with you. The Organic Butter Infused Olive Oil and Dark Chocolate Balsamic Vinegar team up in this incredible Irish inspired dessert. As if this Chocolate Balsamic Bread Pudding wasn’t flavor packed enough, I topped the whole thing off with Guinness Chocolate Sauce and Whiskey Whipped Cream. What can I say? My month of Guinness infused goodness continues. Now, if you’ll excuse me, I have a bread pudding to go eat. Will you judge me if I eat this for breakfast? 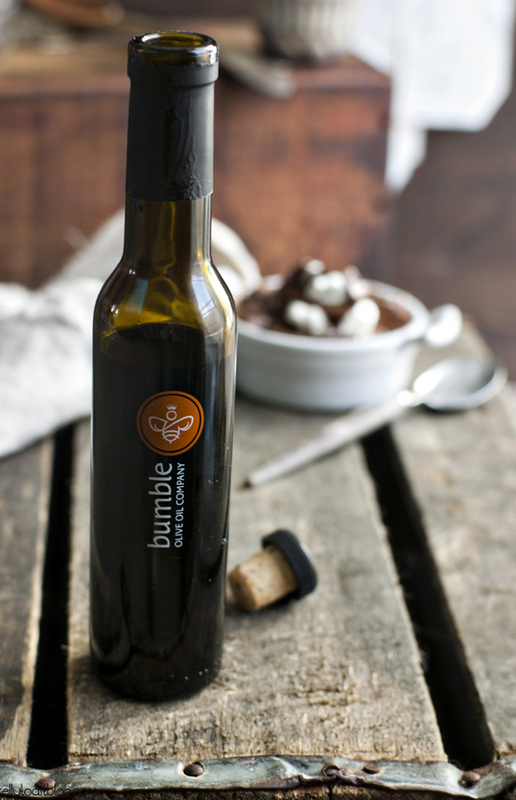 This post is part of an ongoing relationship with Bumble Olive Oil Company. While this is part of a series of sponsored posts, all of the opinions shared within this post are completely my own. Brush eight 6oz ramekins with Bumble Organic Butter Infused Olive Oil or softened butter. Place ramekins on baking sheet. Divide bread pieces between ramekins and set aside. In a small sauce pan, heat half and half, chocolate and 1 Tablespoon of Bumble Organic Butter Infused Olive Oil over medium-low heat. Whisk constantly until chocolate is melted. Remove from heat and allow mixture to cool slightly. 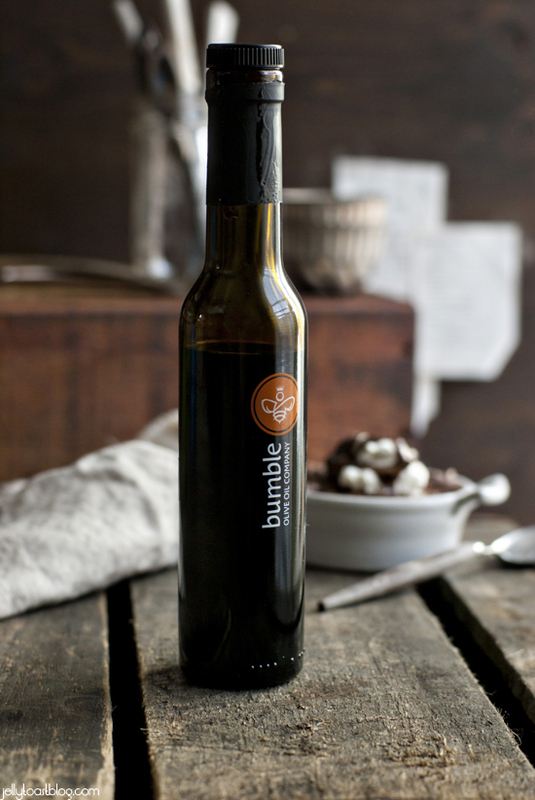 In a large bowl, whisk together eggs, sugar and Bumble Dark Chocolate Balsamic Vinegar. Pour a small amount of the egg mixture into the chocolate mixture, whisking vigorously, to temper the eggs a bit. Then pour the chocolate mixture into the egg mixture, whisking constantly until well blended. Carefully pour the egg and chocolate mixture over bread pieces in the ramekins, pressing down the bread with a spoon as you go. After the entire chocolate/egg mixture is divided between the ramekins, allow it to soak into the bread while the oven preheats. Bake bread puddings for 20-22 minutes or until puddings are set, but still slightly soft in the center. Allow puddings to cool for at least 10 minutes before serving. Puddings can be served warm, room temp or cold. 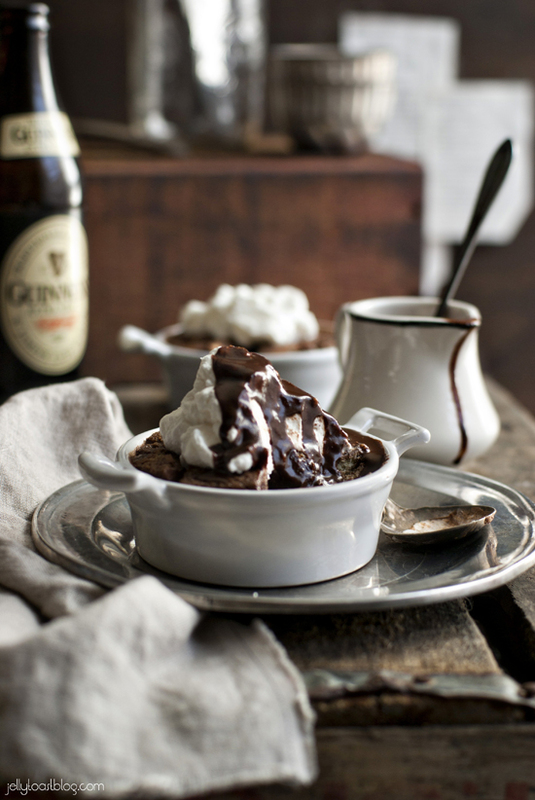 Top puddings with Guinness Chocolate Sauce and Whiskey Whipped Cream (recipes follow) and serve! In a small saucepan, heat all of the ingredients over medium-low heat, whisking constantly until chocolate is melted. Be careful not to scald the sauce. Once the chocolate is melted, remove it from heat. Allow the sauce to cool slightly and serve over bread pudding. Extra sauce can be stored in the fridge. In the bowl of a stand mixer fitted with whisk attachment, beat heavy cream until thick and fluffy. Add powdered sugar and whiskey and beat until just incorporated. Serve whipped cream over bread pudding. Extra cream can be stored in the fridge for up to 2 days. Well, I guess I’m going to have to look for this magical chocolate vinegar then. 🙂 I have a feeling that shots of that would be better for me than the covert handfuls of chocolate chips I usually grab when passing through the kitchen. This recipe is absolutely incredible! I’m so glad I’m not the only one who eats chocolate chips straight out of the bag, lol. You would love this vinegar, though, it is incredible. They also have a maple syrup vinegar and it honestly tastes like maple syrup. crazy stuff 🙂 Thanks for stopping by! Wow! Just Wow!! I’m in love with every aspect of this recipe. 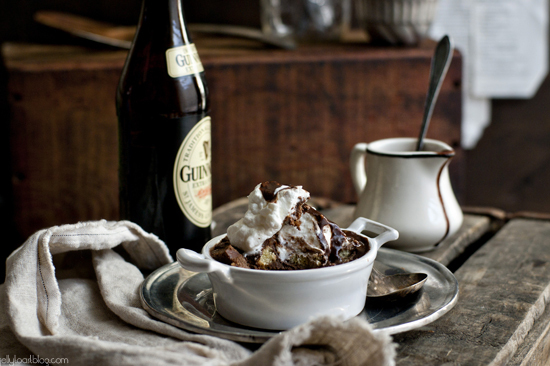 I adore bread pudding and this Guiness version sounds amazing but they you just took it over the top by adding the chocolate balsamic vinegar. I have a SERIOUS relationship with balsamic vinegar so as soon as I saw that ingredient I knew this would be bookmarked for future use. Oh and that whipped cream? Perfection, I’m sure! I cannot wait to make this. Balsamic is the best! I”m such a sucker for chocolate, too. I’m so glad you like the looks of this! 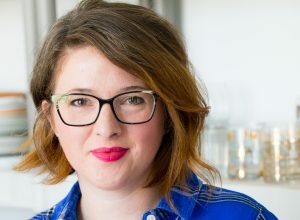 You’re my resident bread expert 🙂 Oh, i totally need to try your sour dough starter, btw. This looks like absolute pure decadence that I can’t even begin to comprehend. It sounds amazing and will need to be made ASAP in my kitchen. I didnt even know any of this stuff existed, and now I”m a changed woman. I admit, this recipe seems fairly involved an dcomplicated, but ABSOLUTELY worth it. You’re fantastically creative and really have a creative mind. I know what you mean, Gabrielle. When I planned this recipe, it seemed to get more complicated as I added things. I don’t normally do complicated, either. But once I actually made it, I it wasn’t nearly as complicated as it seemed. 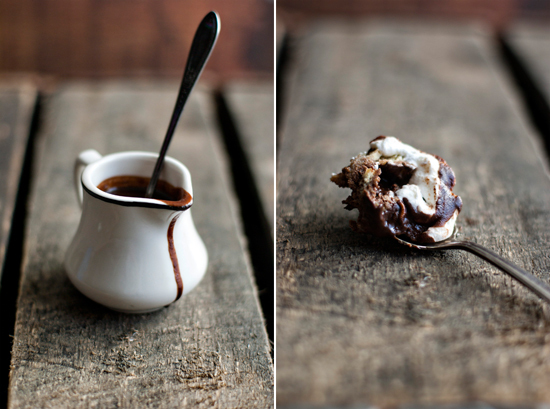 Everything can be made in advance and the whipped cream and chocolate sauce come together really quickly. Gosh, One would need to skip breakfast, lunch and dinner for this wonderful looking and sounding dessert. Terrific ingredients it obtains. Oh my. As I read the name of this recipe I just kept thinking that it couldn’t get any better, and then you threw in whiskey whipped cream at the end. I need this in my life right now. Gorgeous pictures, too! Thanks so much, Ruby!! I’m so glad you like it 🙂 I have been on a major Irish/boozy streak lately. Ohhh heavens…I must find this vinegar! It’s so good, Leslie! Thanks so much for stopping by! Your photos are incredible. Love your blog! Thanks so much, Lindsay! I love yours as well 🙂 Thanks for stopping by! The title of this lured me in. 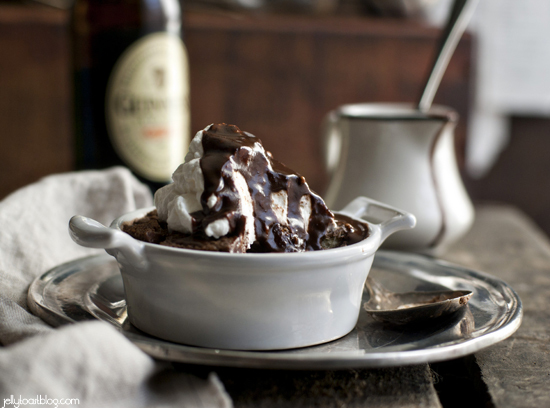 Every.Single.Ingredient speaks right to my heart (balsamic, chocolate, guinness, YUM!). Love it! Hi, I am wondering if these can be made ahead reheated ? yes! This can be made ahead and reheated – I would say about a day or two at most. Thanks for stopping by!